Green People Sticky Hand Sanitiser! Boo has recently decided he doesn’t like hand driers so when we are out and about he will often refuse to wash his hands. I have resorted to carrying hand sanitisers with me everywhere, but have found that they mostly dry his little hands out and with winter coming I have visions of his hands getting very sore. So I was fairly excited when Green People sent us a bottle of Sticky Hand Sanitiser to review, with a natural anti-bacterial agent – extract of tea tree oil! If you don’t know of Green People it is a company specialising in organic skincare, created by a mother in 1997 to help her daughter who suffered from eczema and allergies, and now an award winning Certified Organic skincare brand! The bottle is a little larger than most hand sanitisers we’ve used before, the pump is easy to use and dispenses sensible amounts, meaning Boo could use it by himself. It dispenses as a foam which Boo thought was great fun, and it was easily absorbed into his skin! We loved the smell, Boo described it as ‘like sherbert’ (and I have to agree it reminds me of lemon sherbet crystals!). It was sensitive enough to use on Boo’s face when he was covered in chocolate ice-cream, and easily cleaned the sticky lolly remains from his face and hands! It also works well to clean surfaces, and I used it on a cloth to clean a rather dirty highchair tray while we were out on an adventure yesterday! I’m pleased to say that we’ll be sticking with this hand sanitiser as it doesn’t dry Boo’s skin out, at £9.45 for 100ml I think it is a reasonable price especially as you can use it for cleaning toys and surfaces as well as sticky hands and faces! It’s that time of year where the days are already starting to get shorter, and as the children go back to or start school, thoughts turn to warming winter treats! Whole Earth Food offer a variety of organic treats, yes I did say treats! They believe that eating organic is not only about being healthy but still having great flavours! Last year I reviewed their peanut butter and raved about how we enjoyed it, in fact it is still a regular on my shopping list and no other brand is acceptable in our household anymore! 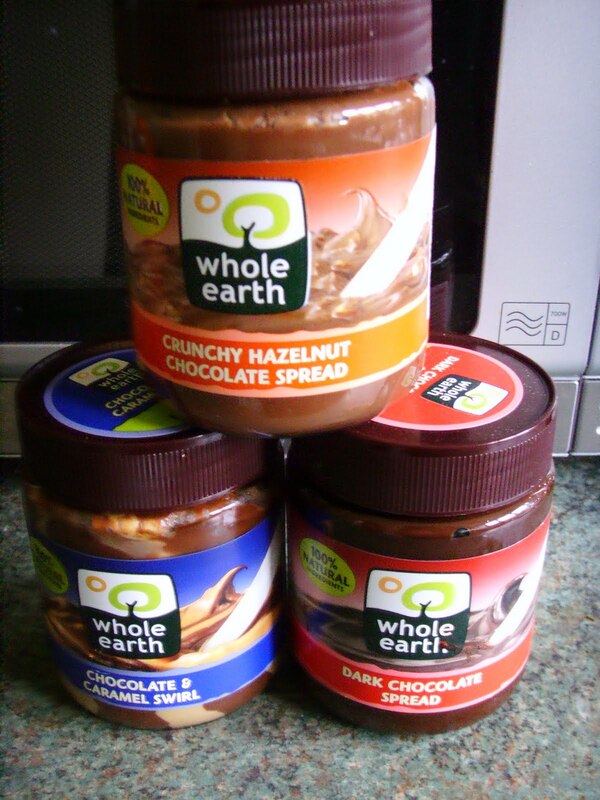 We were lucky enough to be sent a variety of Whole Earth foods fantastic Chocolate Spreads to review! The Dark Chocolate Spread came as perhaps the greatest surprise, I expected quite a bitter flavour and was amazed that actually the flavour is comparable with a rich dark bar of chocolate. There is a super recipe for Dark Chocolate Cupcakes which Boo & I are going to be trying out today! Boo happily sat eating it thickly spread onto toast only to ask for more at the end! It contains 30% cocoa and all the spreads are approved by the vegetarian society as suitable for vegetarians. Crunchy Hazelnut Spread is packed full of crushed hazelnuts, it really is a nutty experience! Mr G & I loved this, Boo found that he didn’t enjoy the tiny bits of nuts in his teeth, although loved it when we spread it onto frozen banana ‘lollies’ as a chocolaty coating! It was divine on toast, really sweet and very luxurious! Mr G enjoyed this on toast in the morning and found he felt full until lunch. Our absolute family favourite and in fact we have already bought another jar (actually two..) has to be the Chocolate & Caramel Swirl Spread it even sounds delicious doesn’t it? This was rich and creamy, when spread on toast it tasted almost like fudge! A teaspoonful sneakily enjoyed in the kitchen was better than a single chocolate liberated from an open box! It is the ultimate treat and perfect to brighten up dull autumn days! I’m experimenting with cooking with this one, and will endeavour to update my best discoveries! Whole Earth food chocolate spreads contain no nasty preservatives or hydrogenated fats, making them ideal for making ‘dull toast’ into a tasty after-school treat! You can find Whole Earth Foods in major supermarkets as well as a variety of health food shops. Follow them on twitter or join their facebook page for more news and ideas! When I was about 3, I was given a pull along Postman Pat van, which was also a shape sorter. I loved it, long after I’d out grown a shape sorter I would drag this little red van around everywhere and make little letters to deliver to my dolls. Postman Pat was always on at around the time I was sat down for lunch after a morning at play school, and I would sit transfixed watching Pat making his deliveries – I always loved the episodes involving Ted the farmer! Luckily for me, Boo is rather keen on Postman Pat too, so I have an excuse to relive my youth and watch still with much the same delight Pat on his rounds! Of course, like me things have changed for Postman Pat and in fact he has a Special Delivery Service now with lots of technology to help him, and complete with an even catchier theme tune! Boo took great delight in tearing open a large parcel the other day, and pulled out to both of our surprise a large red SDS Postman Pat Van! While Boo ran around squealing with delight, I was able to read the enclosed paperwork and gasp as I realised Postman Pat is going to be 30 years old on 16th September 2011! To celebrate Postman Pat turning 30 years Old, he is asking children to send him a Birthday card! Any child who sends him a card will receive a reply from the man himself, via Email! I persisted with breastfeeding Baby G, and over the past 7 days I am delighted to say that I have lost 3lbs and he has gained 11oz which is amazing! I was so delighted that Baby G has made such a good gain as I was contemplating giving up breast feeding altogether. I have made sure that each day I try to express atleast one bottle of milk so Mr G can feed Baby G. This way I get a little rest, as well as having a monitor of how much milk he is taking in. I now feel less guilty for consuming approximately a kilo of chocolate over the last few days as clearly it has been doing neither of us any harm! I’m so far from perfect…I don’t know where to begin! Today is one of those days when I really do wish to curl up in a corner with my head under a duvet. I am having a day where i am suffering from what i describe as ‘Man Complex’ by that I mean I feel totally unattractive as I wipe away the baby sick which is somehow smeared in my hair, and my attire is condusive to a teenage boy – that is to say I am wearing maternity trousers which are hanging around my hips revealing rather more of my bottom than even Mr G would appreciate. Of course that alone i could rectify, but add to that Boo seems to have turned into the Tasmanian devil over night, wrecking everything in sight and refusing to use the potty…well..let’s just say he is now wearing his bedtime nappies again as I don’t seem to be able to get through to him today. Baby G, is sat gurgling happily watching me type, I feel sure he thinks that Mummy is really rather silly, and of course really I am! I wrote yesterday the words ‘I just want to be perfect, and I am so far from perfect, i don’t know where to begin..’ perhaps this is the problem with being a Mummy, sometimes we do just want to much from ourselves. On a positive note, with the sun shining so brightly today, and after an incident where I managed to nearly kill myself on a cross trainer yesterday, I’m looking forward to a more relaxing walk in the country tomorrow! Adventures in losing the baby weight. I’m grabbing the bull by the horns, Baby G is 7 weeks old, and I’m fed up with having to wear my tracksuit everywhere. I have no intention of starving myself, firstly I love food far too much and secondly Baby G is being breast fed. In honesty my main incentives are nothing to do with vanity, they are the realisation that I am no longer very fit – ( I get out of breath running to the kitchen..) and family health issues which make me think I really do need to sort this out! While I don’t look fat as I’m almost 6ft tall (no really, I am) I am more than aware that my BMI is creeping towards the big ’30’ and I’d rather deal with this right now! Enough justifying my actions, and now to lay down my plans in writing so I can’t change my mind and deny any knowledge of plans to get fit! Until I met Mr G, I was physically quite fit, I have never had any speed but always had endurance, now have neither (unless we count chasing a 2year old around the supermarket while shouting ‘No! Mummy does not need 12 bottles of bubble bath…’) So, I am going to exercise 3times a week and set myself goals – the first one being to actually do it. Like many of my friends who are Mummy’s, I have often made excuses as to why I can’t exercise ‘I haven’t got the time’ ‘No babysitter’ ‘The house needs cleaning’ (you catch my drift?) so I’m aiming to involve Boo and Baby G as much as I can, as well as keep one of my three as Mummy time. I started yesterday, getting out in the winter sunshine and taking a walk, Mr G had the day off which made it an ideal opportunity to explore the countryside and get Mummy walking! Having wrapped ourselves up, put Baby G in the baby carrier, and ensured we all had wellies on (it may be sunny but it is still muddy!) we set off. Boo loved it, and we found ourselves jumping in puddles, laying on the ground to closely inspect caterpillars and searching for the lost tractors whose tracks we found on the bridleway. When we got home we checked the app on Mr G’s iphone to see how far we’d walked and were suprised we had walked 4miles…it really hadn’t felt that far! So I’m inspired that I can do this! Whole Earth Crunchy Peanut Butter – How can you resist! I have always been a huge fan of peanut butter, especially crunchy peanut butter! So when the opportunity arose to sample some organic peanut butter, how could I refuse? When i read that there were ‘no added nasties’ before opening the jar, i was slightly anxious remembering my parents attempts at ‘Home-made peanut butter’ which always tasted terribly bitter. However, as soon as i opened the jar and could smell the peanut butter, I couldn’t wait to try it out. Spreading it thickly onto toast, it spread easily and the crunchy bits were plentiful (all to often crunchy peanut butter is just not crunchy enough!). The taste was superb, really rich and moreish, it was like eating a handful of peanuts, no bitter taste just pure luxury. A superb balance between rich buttery flavour and the crunchiness necessary to satisfy any crunchy fan! It is suitable for both Vegetarians and Vegans, and contains absolutely no added sugar! I now feel i can indulge my peanut butter urges, in a healthier manner, with the knowledge that all the peanuts used in each jar of Whole Earth are organically grown, and with no added sugars, it really is the best way to enjoy a wholesome toast topper or sandwich filler. It has proved highly popular with my toddler, and as such it is definitely on my shopping list, what more could I want than a healthy organic product her child loves? What is special about Whole Earth? Whole Earth offers a range of organic and natural foods, and as they started off in 1967 they have plenty of experience in creating tasty food! They have recently won the Vegetarian Society’s award for Best Breakfast Product. From my personal experience, i have found them to be a company who are passionate about their products, and really care about ensuring they have the tastiest organic products on the market. Whole Earth, are currently running a competition celebrating whole hearted living, do you embrace the ‘Good Life’ in the style of Tom and Barbara? Tell them what you do towards greener living and you could win £1000 and more importantly the chance to become an ambassador for Whole Earth! Aveeno Skin Relief Moisturising Lotion, Fantastic for anyone suffering Ultra Dry Skin! I am a member of the Aveeno Discoverers Programme, so I am lucky enough to be sent products from time to time to try and give honest feedback on! The latest product I have been sent for review is their Skin Relief Moisturising Lotion. In the winter in particular, I suffer terribly with very dry and often sore skin. My legs in particular often look as if I would be better suited to a mermaids tail due to their scaly appearance! Anyone who has suffered such dry skin knows, that moisturisers can be terribly sore to apply, so I approached this with caution! Unfragranced, i gained a little confidence after applying a tiny amount to my hands without reaction. I applied liberally to my arms and legs, which was a mistake as the consistency is a little thinner than other aveeno products, so it took around a minute to absorb – but it DID absorb!!! Instantly I noticed my skin start to approve in appearance, almost as though my skin was ‘drinking’ the lotion!! I applied the product in the evening, and in the morning i observed that still my skin looked better than after application of my usual moisturiser – it still looked moisturised! I have been using the lotion for almost 3 weeks now, and am delighted to say that my scaley legs are a thing of the past! I apply the lotion every evening before bed, and my skin is soft and looks healthy all day, without the need to continuely reapply! Sore skin feels like a thing of the past! The main active ingredients are Shea Butter, Triple Oat complex – Oat Oil, Oatmeal and Oat Essence. When things get a little rough I turn to a bit of LUSH.. I have become a huge fan of anything which does a job quickly and effectively, and following on from my post about the diminishing nature of my cellulite, (hoorah!) I wondered if i could do anything else in my 15min to boost the look of my buttocks! I’ve always been a huge fan of Lush, the colours remind me of playdoh, so bright that i just want to pick everything up and sniff it! I have used their bath bombs, bubble bars and melts for several years and enjoy the treat of a massage bar every now and then! But i have discovered a new favourite….BUFFY! This is my new winter Mummy must have! Describing itself as the ‘Slayer of unsightly bumps’ I had to try it out, and I am converted!! Presented as a square of what looks like a soap, Buffy combines exfoliation with moisturising in a bar form, so it is easy to apply and highly effective! It has a very subtle smell, so can be combined with any other products easily, enabling you to use in combination with your usual soap/bubbles etc! Ground rice is the main exfoliant ingriedient which seems to give the perfect balance between enabling you to feel the effects without leaving your skin sore, this combined with luxurious shea butter leaves skin incredibly smooth and after using it 4 or 5 times the results are highly pleasing! My bum has not been so smooth in years! Buffy definetly slayed my bumpy bits! A 90g bar is £5, which i think is a bargain as the 90g bar will last me ages! Just one thing to watch is if you are using it in the bath, the shea butter can leave the bath a little slippy – not good for anyone especially not Mums2be! The joys of Easy Toning! When I first read about Reebok’s Easytones, I laughed and announced that only idiots with more money than sense would fall for such an expensive product which clearly won’t work! I read some blogs via Reebok Women, and decided that the women were a bit bonkers, surely they couldn’t work, I mean, where is the science behind it?! Shoes cannot tone your bum!! A few months later, and having lost almost 2stone of baby weight, I was tempted by ‘That Bum’ in the advert to try a pair on.. I ventured into a big sports retailer and tried on the standard mesh version, I was disappointed to discover they were stupidly wide on my feet, and felt somewhat like flippers. The staff had no interest in ‘fit’ and just wanted to know if i was buying them or not, and i felt disappointed with the experience. As I was leaving a very young member of staff approached me and said ‘try the leather look ones, the fit is much tighter’ so with a renewed sense of my worth as a customer I tried on a black and bronze pair (which looked remarkably like the reeboks of the 1980’s!). Joy! They fitted, and felt erm, bouncy?! Right, these were being purchased and coming home with me!!! The first day of wearing my easytones, i found that my lower legs and ankles ached more than anywhere else. This I believe is due to the fact they are heavier than my normal footwear! I also noticed for the first time in years, I was standing up straight, infact I was quite impressed as my new posture made me look instantly slimmer..hoorah!! I have to confess I instantly became a little addicted to wearing them in order that I might see a ‘result’ sooner rather than later! After 6weeks, and wearing my easy tones at every opportunity – feeling encouraged to walk ‘just that little bit further’ I noticed something rather pleasing… the backs of my thighs were showing signs of being smoother! Now, I don’t mean I have the legs of a teenage pop star nor the bum of Kelly Brooke, but seriously…I put on my shorts and bounced around with glee! No longer did I feel I needed to take an awkward stance or wear an extra long t-shirt, these legs are ok!! More than OK!! Unhappily, the shoes have done nothing to firm the blamanche consistency of my inner thigh but hey, a girl can’t have everything? (not all at once anyway! ).